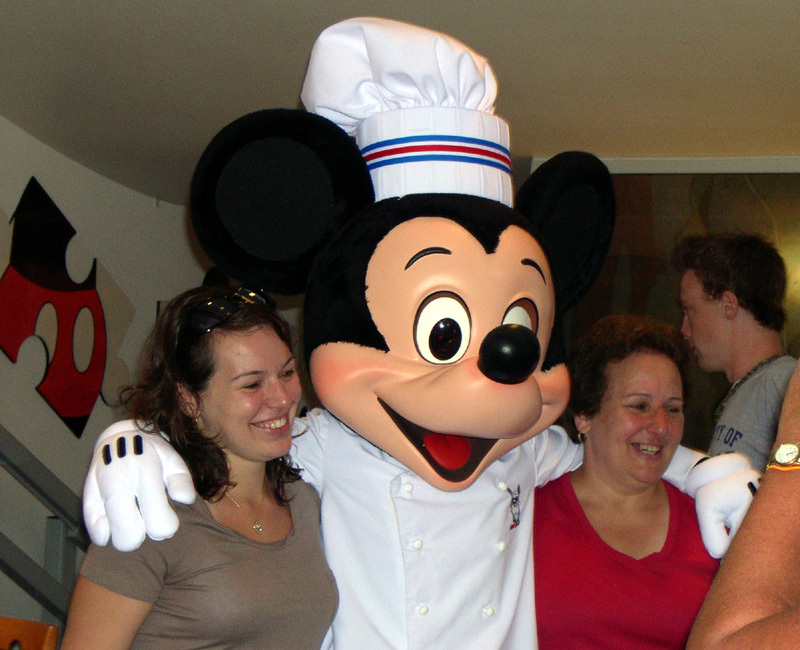 This trip features a group of 25 people heading down to see the mouse. We did a similar trip in 2006. Kelli and I woke up at 4 for a 7 am JetBlue flight out of Kennedy. Bill and the limo picked us up for the airport. We had a very smooth flight down and arrived at 9:27AM; over 30 minutes early. I quickly picked up our rental car from Hertz, we had an intermediate size. They first tried to give us a Prius - beep, beep! (Secret Jeff Dunham reference). I declined since we had three people, with two over 6 ft and 6 pieces of luggage – no way. They gave us a Versa, which I never heard of. It ran fine but not what I would expect from this class of car – and the price! We barley fit. Next time – Enterprise! Forget Hertz in Orlando. 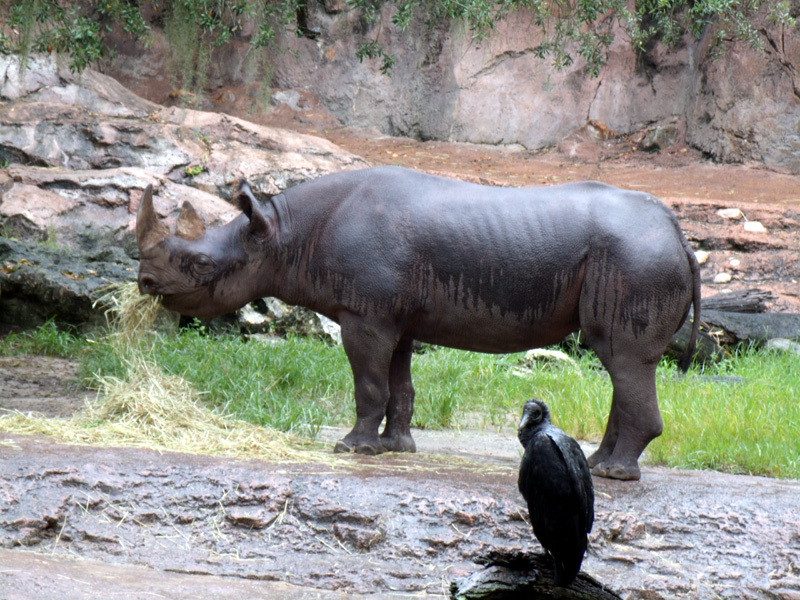 Later we drove over with Bill to the Animal Kingdom Lodge for our 4:40 pm Boma reservation. The hostess’s name caught my eye and I asked how to pronounce it. She was Janeke, from Johannesburg, South Africa and her name is pronounced (jah-nee-kah). We had a great meal sitting in the large alcove and we all ate a ton since none of us had a substantial lunch. For drinks Kelli had a pineapple mojito and I had the Magical Star Cocktail - mango/passion fruit liqueur, coconut rum pineapple juice & glowcube. We ended up liking each others drink. Kelli thought the mojito was too minty. I thought it was very refreshing. The buffet had a peanut soup that I’ve never seen here before. It tasted like warm liquid peanut butter and not surprisingly Kelli loved it. The dessert area is what all buffets should be like. Each had a small serving size so you can try all of them, and then go back for your favorites. The Zebra Domes desserts really hit the spot; there was a strawberry one that everyone likes as well. Cost for three with drinks: $135 + tip ($162). Spaceship Earth didn’t have a wait so we did that first. This was the first time that I noticed the Mouse Trap game on the floor in back of the couch in the Age of Invention scene featuring the moon landing. This was one of my favorite games growing up. The video at the end with us had us skiing and breaking my arm. In the Siemens area after the ride; we sent a couple of video greeting cards home, did Super Driver - a driving simulation video game, then Body Builder - a 3-D game allowing guests to build a digital human body. We then headed to the Imagination Pavilion and saw the revived Captain EO. The theater was only ¼ full. 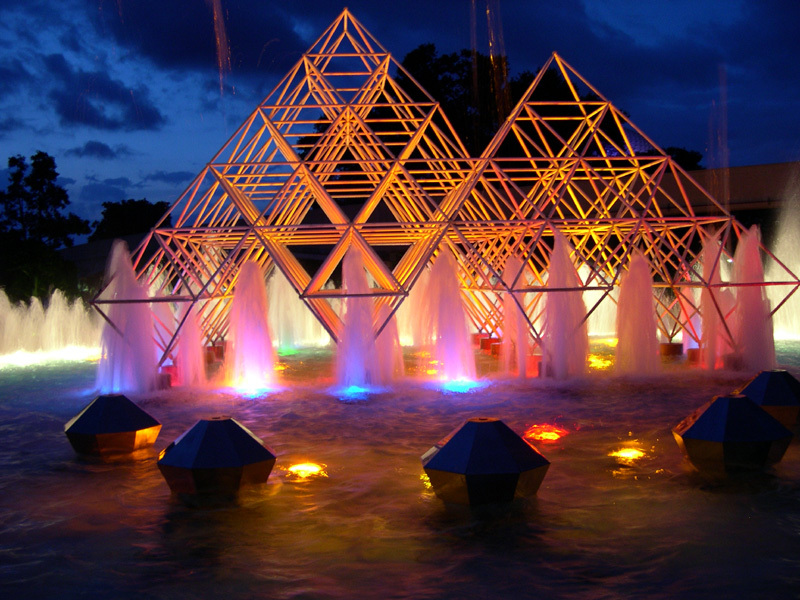 Neither of us had ever seen it when it was at Epcot in the 1980’s. It was better than expected. It was a mix of camp and great sci-fi from George Lucas, the executive producer. It really reminded me of Michael Jackson meets the Borg (from Star Trek: Next Generation). I’m sure that’s where they got the idea for the Borg queen. We then did Journey Into Imagination With Figment. 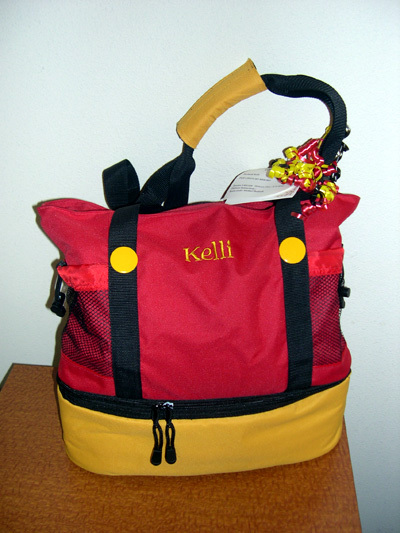 Once outside, Kelli took a call from her sister Joan who would be heading down on Saturday. The Imagination area was almost deserted and the cool lights made for a beautiful and eerie setting. Next was the Seas pavilion and we walked right onto a clam mobile through The Seas with Nemo & Friends – this was when I noticed it was really empty in Future World, especially considering it was extra magic hours tonight! 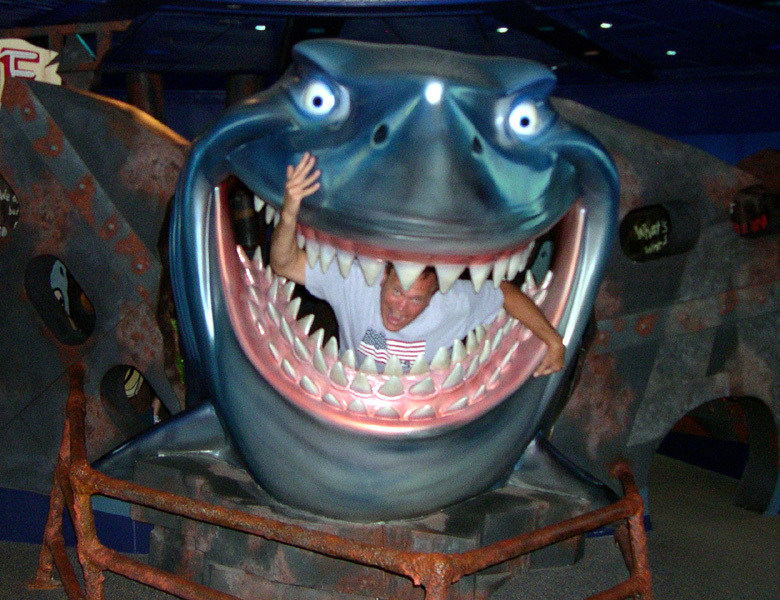 The Bruce the Shark area was deserted, and we had a leisurely look at the small aquariums and even posed in Bruce’s mouth without anybody getting in the way. The effect of an early wake-up was finally setting in so we headed back to Pop for a good night’s sleep. We woke up at 6 and got to the food court by 6:30. Only two of the stations were open. I got my first Pop century waffle for breakfast and all three of us headed to Disney Hollywood Studios by car for extra morning hours. Of course we headed for Toy Story Midway Mania at opening. The fast pass line was already huge so we decided to just do the standby line. It said a 30 minute wait but we were on the rise in15. I did OK with 142,000 points, Kelli was ahead of me in the first two rounds, that’s when I found out from her that the higher amount targets are in front for those early rounds. Hint: Hit the closer targets in the first two rounds, then the higher amounts in the back for the others. Bill missed the full Studio Backlot Tour due to technical difficulties two years ago so we wanted to go on that. It wasn’t opening for another 30 minutes so we explored the Honey, I Shrunk the Kids Movie Set area. It has a soft undulating floor. While I was looking for the big dog nose, Kelli misstepped and lightly twisted her ankle. At first I thought that she had twisted it more and that vacation will be difficult for her, but it didn’t bother her for the rest of the trip – whew! I’d advise caution if you go into the play area. I lead Kelli to the big dog nose up the stairs and let it sniff her arm. We headed back to the tour which now had a small line. In the queue with the presentation on making the Pearl Harbor movie, Bill commented that there were a lot of Japanese tourists on line – he didn’t think they’d like this part. (Roll eyes). I let Bill get into the tram first so he could see the full effect of Catastrophe Canyon. He later commented that it looked more impressive on TV. We shopped our way out of the park and drove over to Animal Kingdom. We were just in time to see the next showing of the Festival of the Lion King- Kelli’s favorite. We were warthogs (Snort! Snort!) We then did It’s Tough to be a Bug, practically walking right into the theater. After Bug we took the back trail, left in the exit queue, (as suggested from Mouse Planet posters) to quickly get to Africa and see some seldom seen animals along the way. The path runs along the water. We saw Nēnē (Hawaiian Goose), and saw a cast member feeding a Saddle-billed Stork. It was only feet away. We spoke to the cast member for a while (Kevin from Chicago) – he suggested coming down in February when it’s not crowded and hot. More animals would be active. After this Bill headed back as the humidity was getting to him. We needed something cold and alcoholic so we stopped at Dawa Bar and both got a Dawa Colada (Bacardi razz rum, with pina colada mix and raspberry purée). It was delicious as we took refuge in the secluded sitting area behind Tamu Tamu refreshments. Afterwards we headed toward Asia for the egg rolls that I heard were good. We stopped to take a photo with Flick the ant which flirted with me (shaking her/his/its? booty) as Kelli was putting down her pocketbook. I thought Flick was a boy ant? 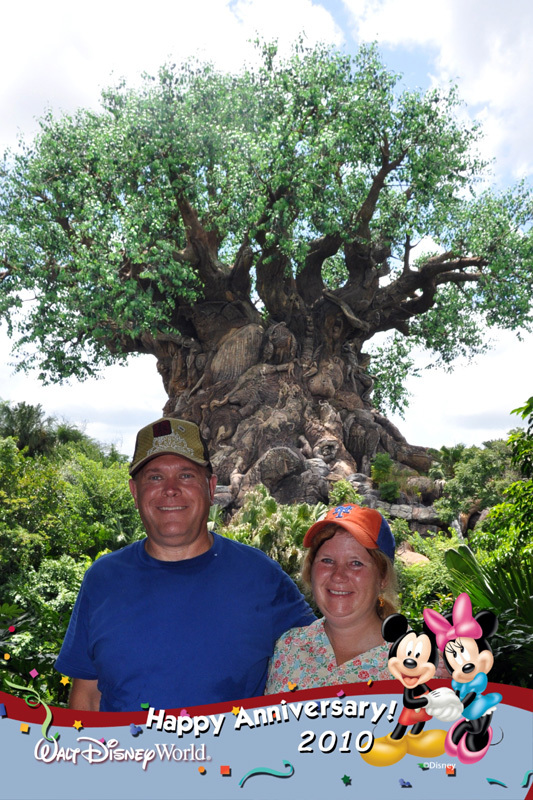 We stopped for a Photopass photo at what I believe is the best view of the Tree of Life - halfway between Africa and Asia. The trees on the path frame an unobstructed view of this 14-story giant icon. We found the egg roll stand along with a corn dog nuggets stand. We bought both and headed back to that secluded sitting area when we ran across Ms DeVine – my first time seeing her! The drink and heat were getting to Kelli so we headed back to Pop Century for a rest before our late anniversary dinner at California Grill. Kelli warns; don’t have a drink on an empty stomach when it’s hot out. During her rest I decided to tour Pop Century and take pictures from all the fourth floor walkways. It was brutally tiring walking up all those steps to each building. But the photos I collected were worth it. I stopped by the bridge on the lake and was happy to see fish and many Soft-shell Turtles there. We found none last year. Two interesting things I noted. One, they are cleaning up around the buildings across the lake, getting ready to expand Pop. I hear more family suites will be in the new buildings. And two, you can see the Welcome sign on Osceola Parkway from the 80’s buildings. I put up a web page featuring most of them. We showered and dressed for our vacation anniversary dinner. (Our anniversary was technically a week ago but this was the only week that all of us could get down here). 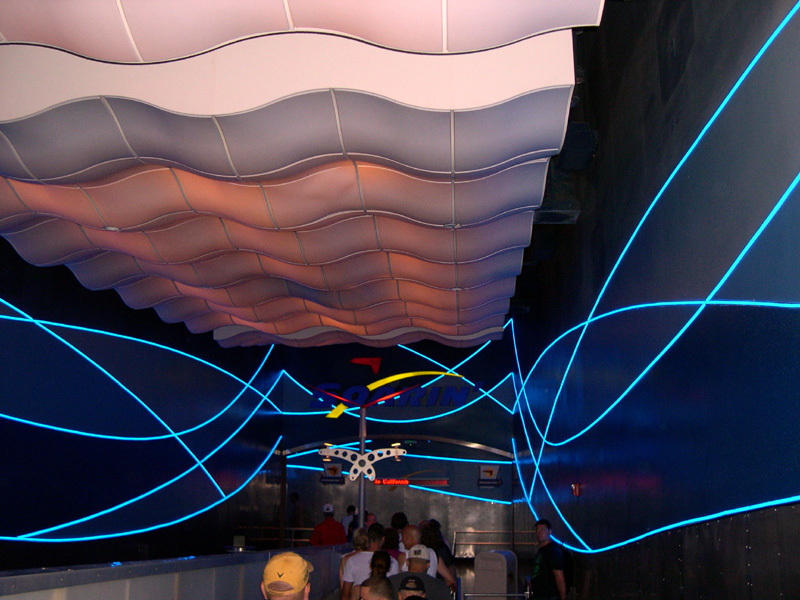 We headed to Magic Kingdom by bus, and then took the monorail one stop to the Contemporary. We had time before our reservation so we shopped in their gift shop. They had a nice collection on pins, lots of Chip & Dale and new stuff. I brought a Phineas and Ferb Pin. We had a leisurely and wonderful dinner at the California Grill. I was looking for something different and adventurous to drink so I tried the - Simply Nutty (Black Walnut Liqueur, Amaretto, Frangelico, and splash of half-and-half.) It tasted like a white Russian with a nutty flavor - very interesting drink. For the first course Kelli had the Triple Cheese Brick Oven Fired Flatbreads-with Pecorino, Asiago, and Provolone with Sun-dried Tomato and Arugula Pesto and I had the Spicy Kazan Roll - crab, shrimp, bay scallops, tuna and fireball sauce. Both were good. For the main meal we both had Grilled Pork Tenderloin - with goat cheese polenta, button mushrooms and zinfandel glaze. It was another excellent choice. Kelli was too full so I ordered Sweet Celebration for dessert - Warm Apple Cobbler, Walnut-Oatmeal Streusel, Calvados Ice Cream, and Apple Caramel Drizzle. California Grill brought out a special Chocolate Cake for our anniversary. Both desserts were so rich and filling we couldn’t finish them. Note: we still both agree that Artist Point in the Wilderness Lodge is the best place we’ve eaten so far in Walt Disney World. 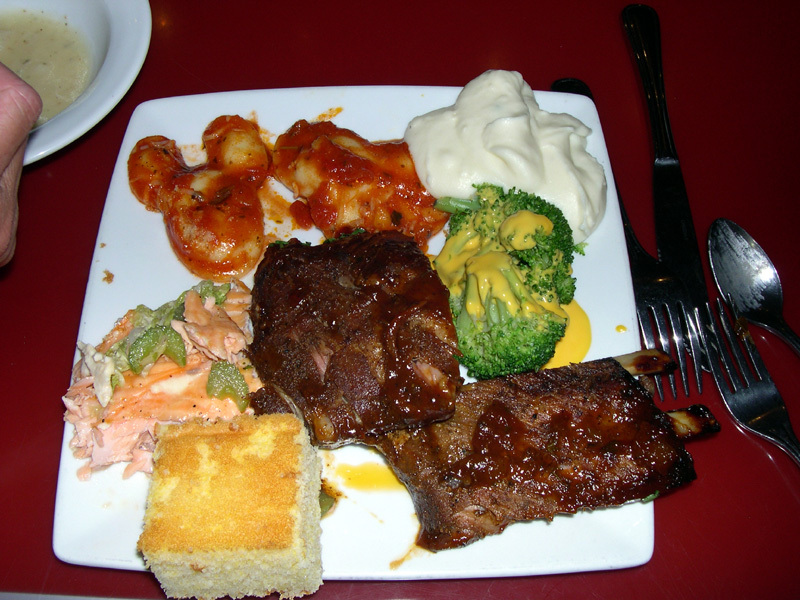 Kelli gave California Grill three stars. We timed the end of dinner perfectly with only a few minutes before the Summer Nightastic Fireworks Show at the Magic Kingdom. We went outside the restaurant on the walkway on top of the Contemporary. They piped in the music for the show. It was very cool but a bit weird to see how spread out the fireworks are, many going off behind Space Mountain from our point of view. Afterwards we let the crowd on the terrace dissipate and then we heard music coming from the other side of the building. We went back inside, passed the elevators and rest rooms to this other walkway. It overlooks Bay Lake, where the Wilderness Lodge sits. 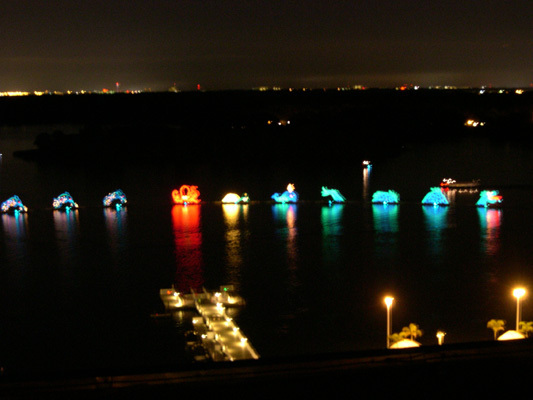 The music was coming from the Electric Water Pageant, just off the docks of the Contemporary. 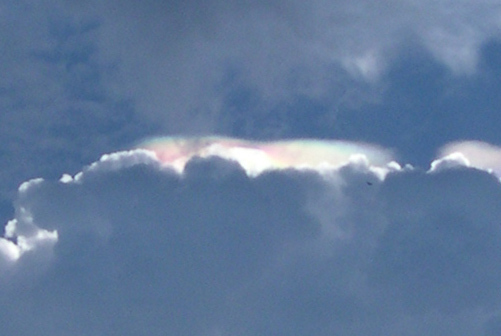 This was an added bonus and was another first for us - a great way to end a perfect day. The majority of our group will arrive today. We took this opportunity to first sleep in, till 7:30, and head to Melbourne to visit some friends. We got back late and found most of our group in the bowling pin pool. We did a quick dip in the pool and relaxed outside the room drinking Dogfish 60 minute Pale Ale, Mudslides and Seagram's Wild Berries Wine Coolers that we had purchased at Publix on Thursday. Tomorrow is the first day the whole group will be touring together. We woke at 6 AM sharp with a wake-up call from Mickey and Stitch. Twenty-one of us headed to Epcot today for morning hours. We planned to meet at the bus stop at 7:30; some arrived early and a few needed to run to catch the bus but surprisingly everyone made it. We arrived just after opening and we had two runners get fast passes for all of us for Test Track. We met up at the Land Pavilion and rode Soarin’ through the standby queue. Kelli and I got fast passes to use later. Everyone then rode Living with the Land and saw the Circle of Life movie. Next was The Seas with Nemo & Friends followed by an excellent Turtle Talk with Crush. Everyone wanted to try Club Cool till our Test Track fast passes were due. I told everyone that Beverly from Italy was the best tasting out of all of them and they all fell for it. Bill took a big swig and said he couldn’t get the bitter taste out of his mouth. He kept drinking all the others trying to get rid of it. We crossed Future World to the other side. We had another runner get fast passes for Mission Space then most of us did Test Track. We filled three cars and I had all three pictures from the ride added to my photopass card. It’s the only ride you can do this. Next up was Ellen Energy Adventure - Kelli, Bill and I needed the rest rooms so we exited the queue and headed into Innoventions East where I saw the Sum of all Thrills where you build your own ride. It looked great but we never got back to it. We made it into the pre-show just as Ellen chastises the late comers for coming in late and not knowing what is going on. It’s great when you’re part of the joke. She does a half-minute recap and we went into the show, finding the rest of the group to sit together. Two more of our group had just arrived from NY into the park. We arranged to meet outside the Electric Umbrella. Now was the time for a family tradition (my sister-in-law’s) of cheese and crackers for lunch. 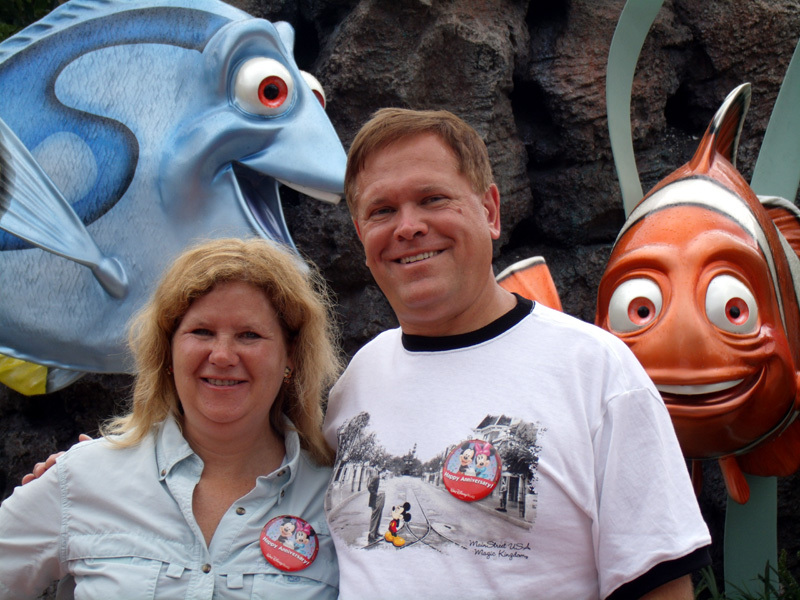 Joan and Rich started it years ago when they took their four sons to Disney and tried to save a bit of money. 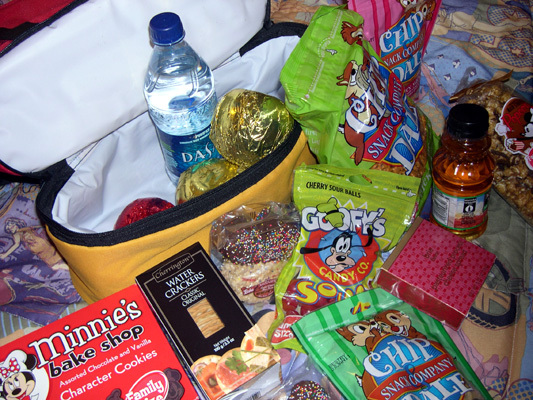 They pack a backpack full of cheese, peanut butter, jelly and crackers and make ice tea to drink. Now it’s something everyone looks forward to. Yes- we brought in enough to feed 23 people. After lunch most of us shopped in Mouse Gears. 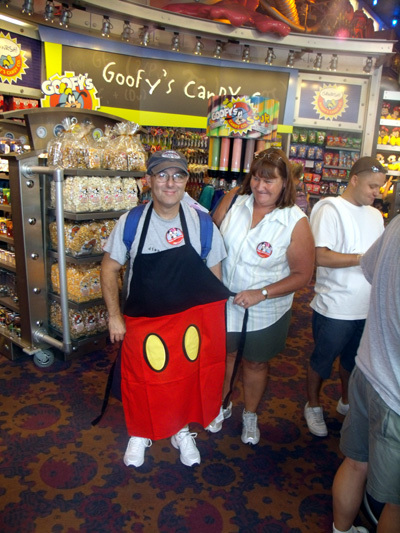 Rich found an apron with a Mickey Mouse pants design, but the buttons were poorly placed. We then split up, eight of us, which included myself, four nephews, one fiancé and two of their cousins went on the Orange side of Mission Space - my favorite ride at Epcot. Kelli and another of my nephew’s cousins shopped and waited for us. All ten of us then went on Spaceship Earth. My nephews made fun of my old Animal Kingdom hat while waiting on the queue. They said it looked like a trucker’s hat and nicknamed me Bubba. Kelli and I split from the group and did some shopping on our own down by the two shops in Showcase Plaza. Each of us donned pirate hats. I think I looked a little ridiculous but Kelli looked cute in hers. We saw one of the two monorail trains that are painted for the remake of the "Tron" movie. We did the Gran Fiesta Tour starring the Three Caballeros in Mexico to kill some time before our early reservation for Le Cellier in Canada. 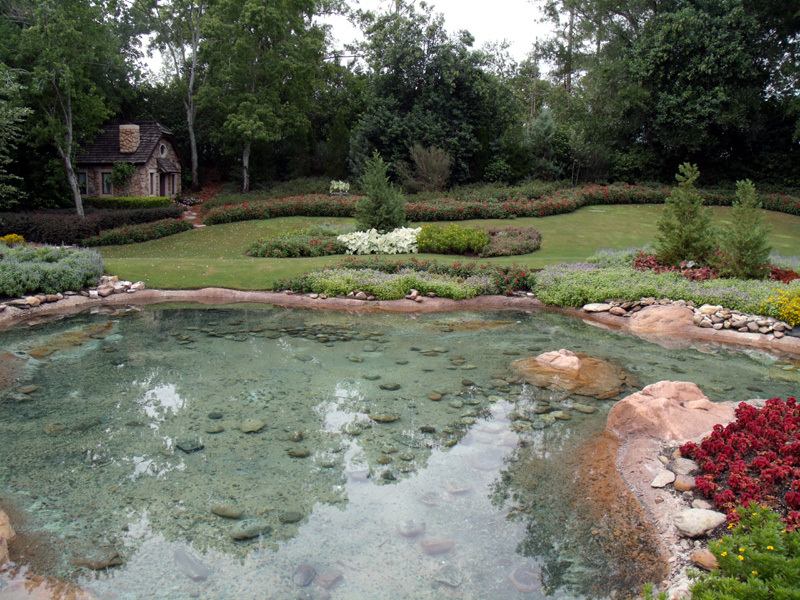 The pond and garden area here is one of my favorite spots in the World Showcase. 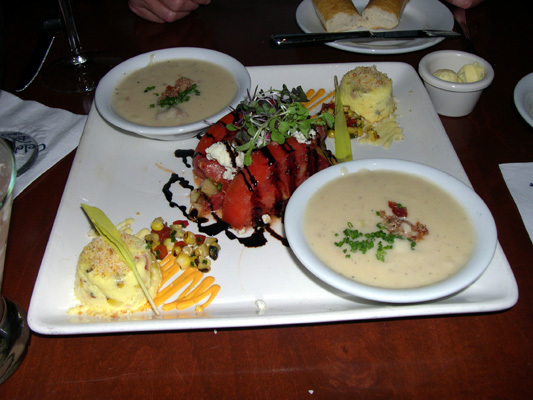 We shared the Appetizer Trio to Share - Tomato Stack, Lump Crab, and Canadian Cheddar Cheese Soup. Kelli really like the soup best and the crab cake second. I thought the tomato stack and cheese soup were the best of the three. Kelli ordered the Coffee-rubbed Kansas City Strip Steak - with hazelnut butter and cream cheese mashed potatoes. I ordered the Le Cellier Mushroom Filet Mignon - with wild mushroom risotto, white truffle and herb butter sauce. Both entrée’s were excellent and we shared half of each with each other. As usual, we both thought the others choice was a better one. I just had to see and try the Chocolate "Moose" - Chocolate Mousse rolled in Toasted Chocolate Crumbs with Maple Leaf Antlers. Kelli had a wonderful Passion Fruit Sorbet. Bill came to $149.62 with tip. 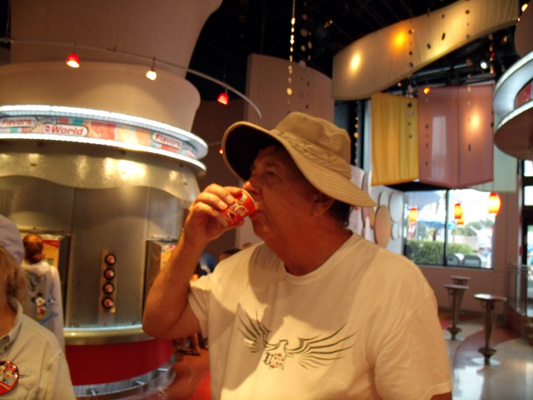 We then rode Soarin' with our Fast Passes then returned to Pop Century. On the way to our room we were amused at the ducks using the Bowling Pin pool. Thoughts of touring with a large group: This time everything is working great. We are all on the same page. This is different then four years ago when we wasted time trying to get a consensus. The key this time is that almost everyone here was here in 2006. Everyone knows the ropes (Magic Hours, Fast Pass, the bus system, and which rides you must do early.) And they usually let me lead the way. I knew the shortest way from point A to point B without using any of the maps. Today’s extra morning hour is at Animal Kingdom. We arrive at opening and three runners grab our cards to get fast passes to Expedition Everest while everyone else walks to Safari. Half-way there my nephew (one of the fast pass runners) calls his father (my brother-in-law) asking if the group arrived at the safari yet. He said; “No.” I knew right away what was happening but it was too late. Any guesses out there? The group gathers near the entrance to the safari and waits for the 3 runners to get back. We wait…. and wait some more. I tell everyone that the runners saw no line at Everest and went on (that’s what I’d do). Nobody would believe me. My wife even defends them saying that the fast pass lines were just really long. It starts to rain and a six of the group get into the wheelchair queue since my brother-in-law’s father, Mr. F, is in his 80’s and we are using a wheelchair for him. They will take the special truck that holds a wheelchair. That group has to wait for the specially outfitted truck to come around –so their wait will probably be longer. The rest of us wait some more. Finally I convince the rest to get in the queue. Some are worried we left the other three behind and blame me. They eventually call and complain we didn’t wait for them. Great – now I’m the bad guy. My wife is not too happy with me. By the time we got a truck to take the safari, we pass the wheelchair truck ready to go. They will be right behind us. I even got a picture of them in the truck. It is already hot but enough animals are out. I try taking pictures but the ride is so rough very few come out well. We all regroup and walk the Pangani Forest Exploration Trail but the rain starts and makes us speed through the last half. The rain slows so now it’s on to Everest. Half way there our youngest group member, Eric, suggests the Kali River Rapids since we are a bit wet and wearing ponchos. Good idea, except for the people in our group who rushed ahead. We walk right on to a raft. Kelli and I get a good dose of water. On the way out the CM tells Eric “You’re not wet enough. Go on again” So- we get on again. This time a dad with his little girl and boy riding with us get most of the water. We finally get to Expedition Everest. Not everyone is going on. So I get to go on twice with my nephews. Even Disney’s most thrilling coasters are still tame enough for small kids (as long as they meet the height requirement). It is Disney of course! So I use my Flip video camera to film both rides. It’s hard to keep the camera still since you are not holding on to anything, but both came out pretty good. After the second ride I find out it is someone’s third time riding. I was right - they DID go on earlier. There were still a few fast passes left so a few of the thrill seekers went to ride again. I waited for them as the main group headed to the Festival of the Lion King. I then lead the small group to catch up with the main group. We met up with them at the path to Camp Minnie-Mickey! They had gotten lost and headed for the front of the park before realizing their mistake. We all headed over to the Festival of the Lion King. The group was in the warthog section again (snort snort). It seemed very appropriate. The show was fantastic as usual, even seeing it twice in a couple of days. We broke for lunch - cheese, peanut butter, jelly and crackers again. As we finish lunch we saw Chip & Dale. They are Joan’s (my sister-in-law) favorite characters and it’s Joan and Rich’s 35th Anniversary. We encouraged them to get in line and they had fun with the Chipmunks. Kelli and I headed out to avoid the heat and humidity of midday. Some stayed to ride a few more attractions. Tonight’s group dinner is at Chef Mickey’s in the Contemporary. 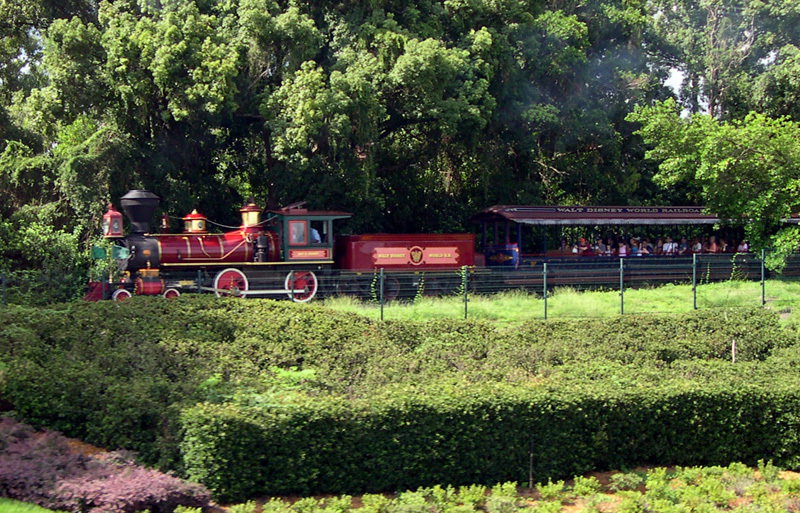 I was able to get a nice picture of the train from the monorail on the way there. We all looked through the gift shop before dinner. I had lost my Phineus and Ferb pin the day before so I bought a replacement while there. We had a short wait to get into Chef Mickey’s . There is a bar just left of where you check in. My nephews ordered beers and I noticed they had the Dogfish 60 minute IPA there as well. 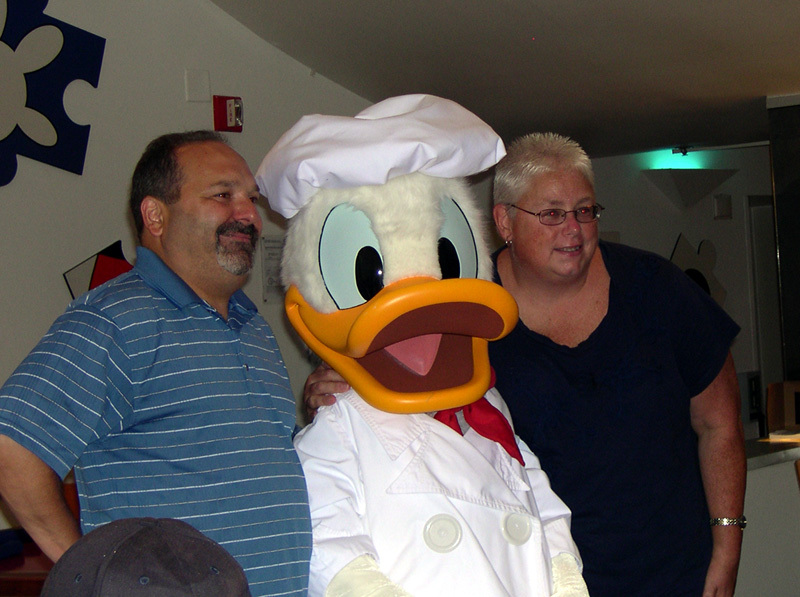 They always take your picture at Chef Mickey’s and we had one of the best photographers I’ve seen. With a group of 23, she took the time to line us up correctly with all faces showing. The picture came out very well and Joan brought the picture later. It was incredibly fortuitous for this to happen for we normally get a group photo on Main Street at the Magic Kingdom. We were going to do this Thursday, but unknown to us at the time not everyone will be there! 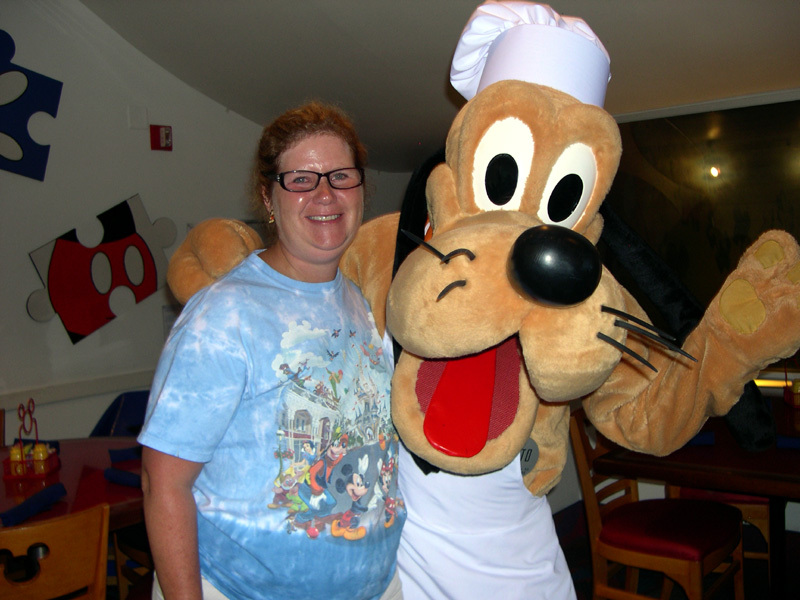 Back to Chef Mickey’s – We get three large tables up in back. It’s difficult to get a lot of character interaction with such a large group, while also running for food. Kelli and I always find buffet character meals are a bit stressful. When do you go for food? Will you miss a character? While eating, do you stop when they come? 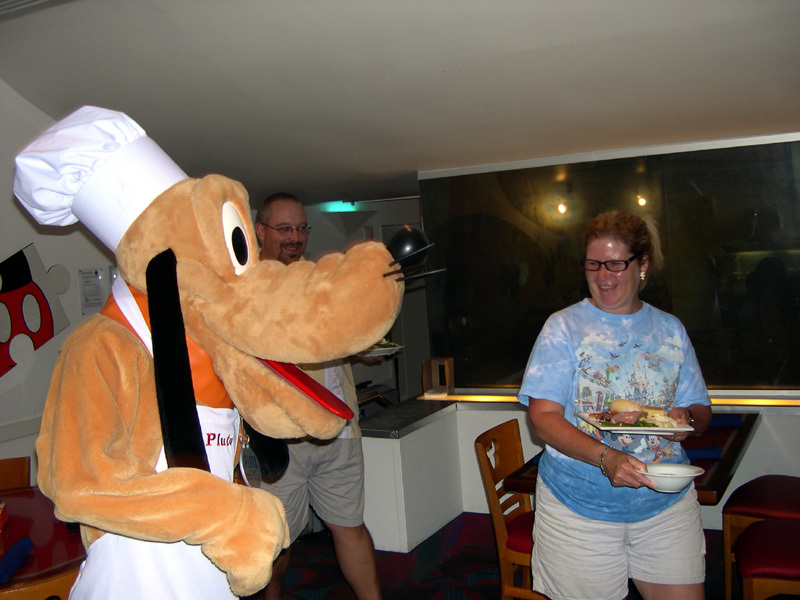 We think character meals like the Garden Grill in Epcot are better. 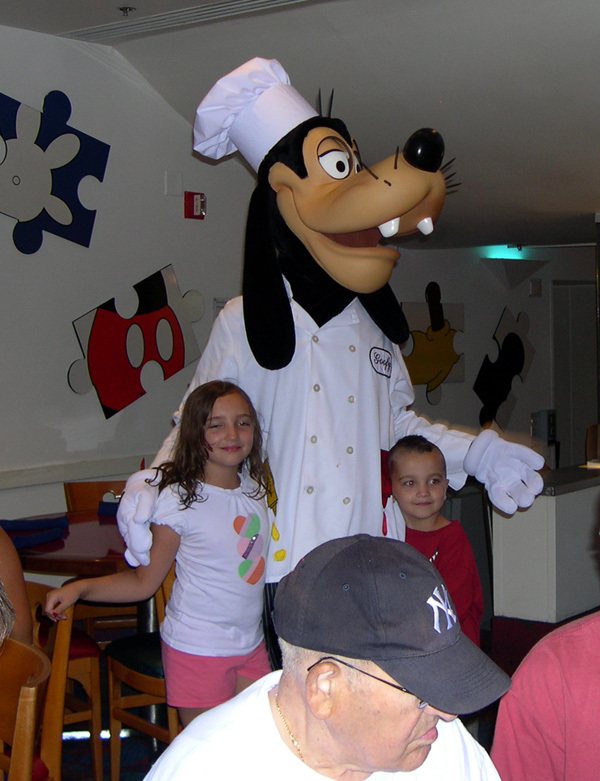 They at least bring the food to your table, giving more time for characters and pictures. All the characters were great and accommodating. It must be tough dealing with a large group when ten people are trying to take the same picture. Mickey, Minnie, Donald, Goofy and Pluto visit our area twice. Joan notices that a young man with his family at a table next to us is celebrating his 21st birthday today, and finds out his name. 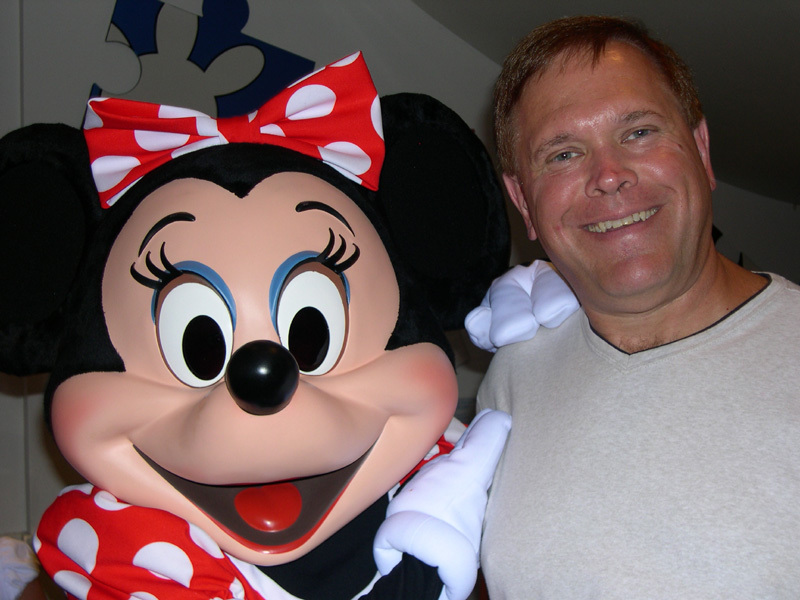 On three – all 23 of us sing Happy Birthday to this complete stranger – a little of our own Disney magic. The look of surprise and happiness from his table was priceless. And in traditional “It’s a Small World” fashion….the young man named Roger ….and his family will be moving to the same town, only a few blocks away, as my nephew’s cousins in Connecticut in a month or so. After dinner we all head for the Magic Kingdom. Tom points out something a little disturbing about the Walt and Mickey statue when viewed from the side. I say no more. 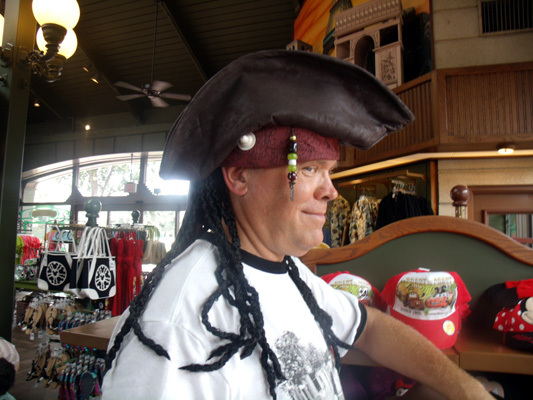 We all head for and enjoy the Pirates of the Caribbean, then head for Splash Mountain. I check my Verizon Disneyworld app and it says the wait is 45 minutes, but the sign says 10. So half the group convince me to go on. Well – it was 50 minutes. We have eleven people. The CM then thinks it’s a good idea to fit all eleven of us in the eight person boat. “It will make a great picture” Well, it’s actually 9 adults and two kids. We all squeeze in. Big Rich, Rich and I were wedged in to be precise. We now realize our boat is easily the heaviest one out there. Boy - are we going to make a big splash! During the ride there are a few points where they stop the boats and meter them out, so as not to let the boats get too close to another. Well, when we go down the mini drops we pick up a lot of speed and almost catch up to the next boat! We are all laughing hysterically -having a great time. We survive the big drop and it was a sight when we had to unwedge each other out of the boat. My wife Kelli along with Patti and Paul stayed off the ride. They planted themselves on the bridge watching the ride….and the unsuspecting guests getting soaked by the spray of water when the ride comes down the big drop. 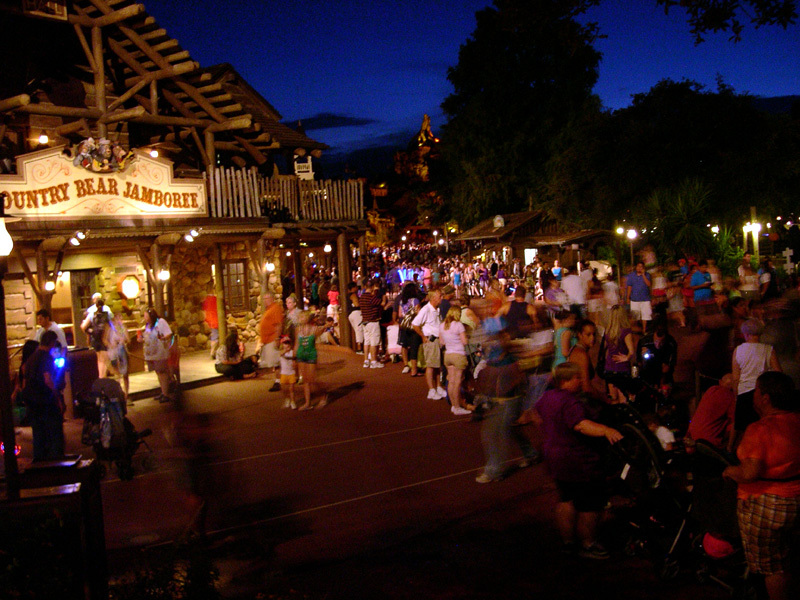 We then stake out a spot to wait for the Main Street Electrical Parade, we are near the Country Bear Jamboree, but across a path leading to Adventure land. There is a planter around a tree that we use as seats, and a platform to see the parade from above. 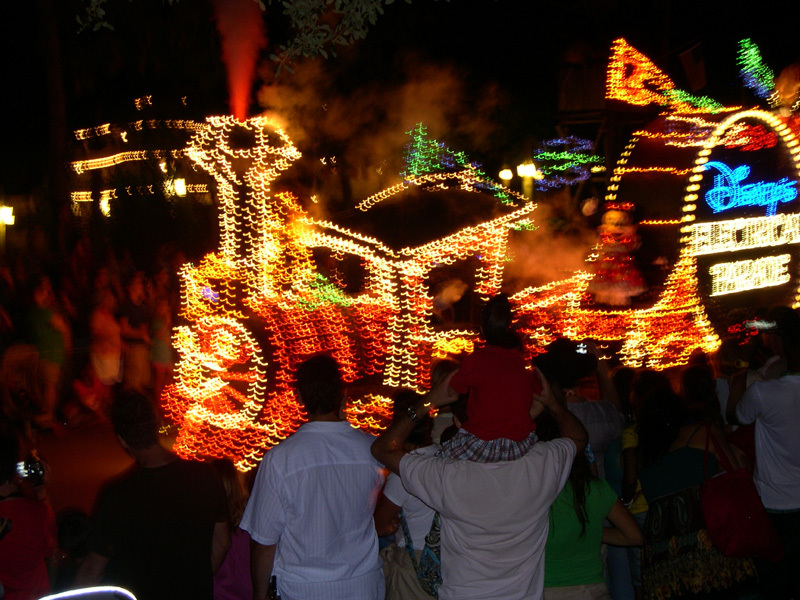 Kelli and I love the floats but we think that the music from SpectroMagic is significantly better. Most of us head out- we want to beat the crowds to the buses after the fireworks. Being there many times; we show our group how to cut through the stores on Main Street to avoid the crowds. The Summer Nightastic Fireworks start as we exit the turnstiles and we watch them from benches near the lake. There’s no music to accompany them but we enjoy them anyway. After the finale we quickly head for the buses. Some of us have a big day at Isle of Adventure to see the greatly anticipated Wizarding World of Harry Potter the next day. 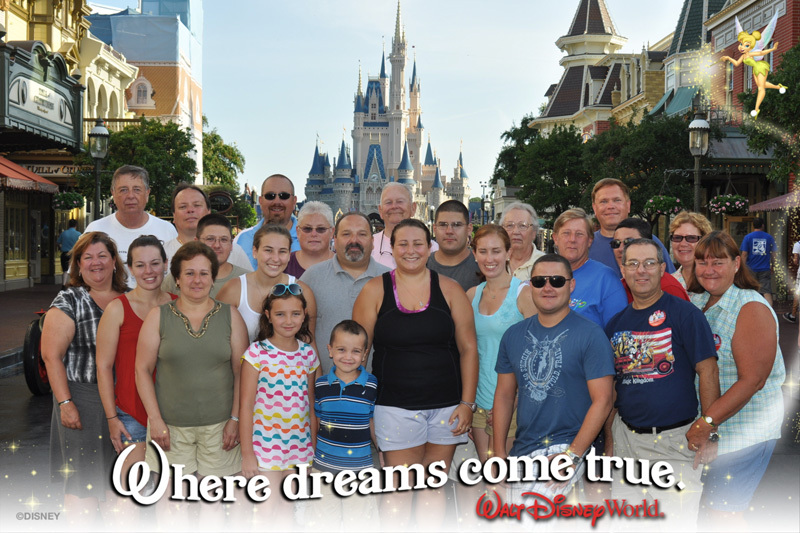 Today eleven of us (Kelli, Rich, Kevin, Mike, Tim, Marissa, Kelli, Katie, Michelle, Rich Sr. & I) headed to Isles of Adventure so see the new Wizarding World of Harry Potter. I took my rental car and Rich had a mini-van to get us all there. We left early to make sure we got there at regular opening. I was surprised they let us in through the turnstiles at 8:30. The park opens for regular guests at 9. We were directed the long way around to a huge queue to wait till 9. By the time we got in, the place was busy. After a few pictures in front of the Hogwarts Express we hit the Dragon Challenge coasters as the lines were very short. Kelli sat this one out. In the outside part of the queue we saw the enchanted car beeping at us, inside we passed the tri-wizard cup. Marissa, a huge fan, was taking lots of pictures. We ended up riding each side once with Marissa and Michelle joining Kelli in between the rides. I left to join the girls while the others went for a third time. While we were waiting we all tried the butterbeer - very sweet and creamy, very similar to a great root beer/vanilla ice-cream float. In the area we found the wanted poster for Sirius Black – and the picture moved just like in the movies. After the others got back we had a rest room break where we discovered Moaning Myrtle wailing, crying and talking in the walls of both the ladies’ and men’s’ room. You did have to wait for the hand driers to stop to hear her well. We made our way into the back part of the wizarding world for the new Harry Potter and the Forbidden Journey ride. The wait time was 90 minutes but we expected that. Kelli walked through the queue with us but did not ride. She took all of our bags so we could skip the locker area in the beginning of the queue. Once the line got into the green house it was an easier wait since there are many things to look at. Inside the castle we saw the incredible detail that went into this place. It makes the rest of the Isles of Adventure look shoddy. The paintings move, Dumbledore, Harry, Hermione and Ron talk to you and it really looks as if they’re there. There are lots of creepy stuff to look at in the Defense Against the Dark Arts classroom. The Great Hall has the enchanted ceiling with hundreds of candles floating in the air. Before getting on our enchanted benches, we loaded up Kelli like a pack mule with all our gear. She later said the chicken exit had a flight of stairs and she was worried about falling down them since she had so much stuff. The ride was fantastic and you wished it went slower to see more of the detail. The whomping willow and a dragon come within a few feet of you - a very thrilling ride. I look forward to going back in the future when the crowds calm down to ride it a few times. When we exited the ride the crowds were ridiculous. The group split up. It took Kelli and I fifteen minutes just to make our way down to the shops. The shops now have lines just to get in them. We had a medium wait to get into Honeydukes –which is connected to Zonko’s. We tried a Cauldron Cake (yummy), Rock Cake (like a moist scone) and Pumpkin Tart (hit the spot) and picked up some gift gags - like screaming yo-yos, an inflatable tongue etc. We then stood on line to the main store (where you can send an owl), but it was way too long. We all regrouped and headed out. We were a little disappointed that we couldn’t experience more but the crowds were too much. The line to get into the land was still way over into the Jurassic Park area. We tried for lunch at a counter service meal across from the Jurassic Park ride called the Burger Digs. It took 30 minutes for all of us to get food! The lines were only 8 people long and they only have 5 main items. We heard they were running behind on cheese burgers. What a poorly run restaurant. We were starting to get testy now. Rich Sr. swore he’d never come to this park again. We made our way down to Spiderman and it started to rain. Kelli went shopping and we stood on line for another hour to get on. After this I’ve had enough of long lines. Most headed for the very long line for the Hulk. Kelli, Marissa, Michelle and I shopped and walked around Seuss land and I enjoyed a root beer float. I noticed that even the Cat in the Hat had a 45 minute wait. Tim joined us – he’d had enough of lines as well. We hit the big store close to the entrance and everyone bought a few things there. 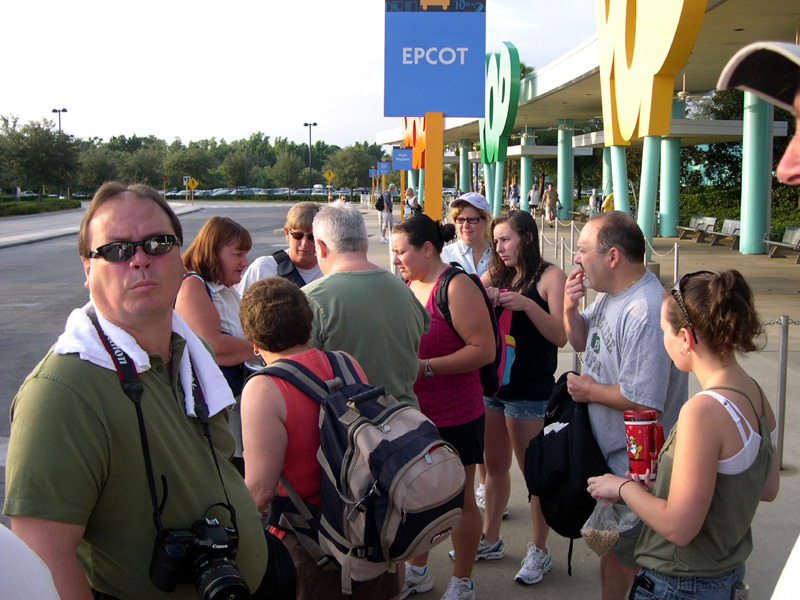 We were ready to head out, however we were holding a few fanny and backpacks of the people still on line for the Hulk. Michelle said she’ll stay behind and wait for the group. At the turnstiles we found an outdoor market featuring 30 % off of merchandise. I couldn’t pass up a bargain and bought a Woody Woodpecker Hat. The four of us headed back to Pop Century. When we arrived back at the hotel we found out the rest of the group was on their way home. We also found out Mr F was taken to the hospital for precautionary reasons from a groin pull he suffered a few days prior and the bruise was spreading. He at first didn’t tell anyone about it for a couple of days – he didn’t want to burden us. In a way it ended up as a good thing. Most important he would be under the care of professionals and it gave him time to rest. 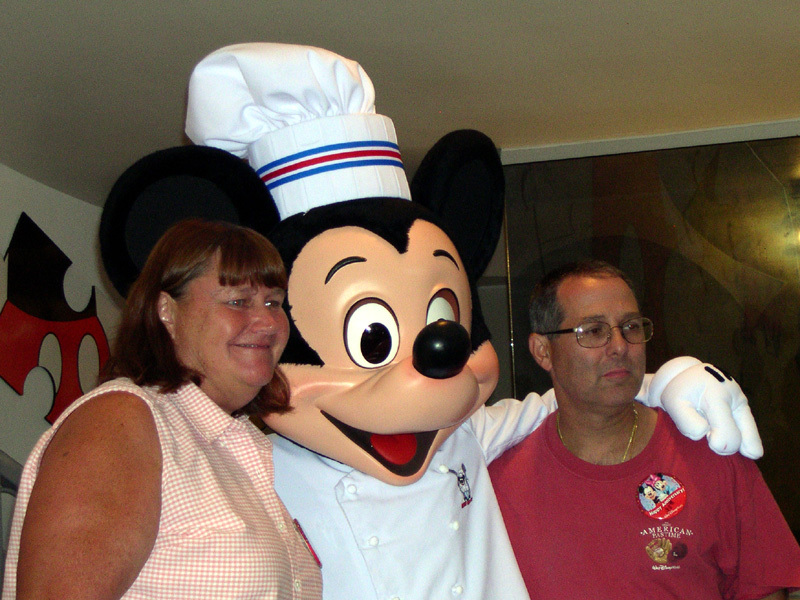 He won’t be out in time for the group picture on Main Street – that’s when we realized how lucky we were in the group photo at Chef Mickey’s. Kelli and I had a reservation for four at Raglan Road tonight. We offered to take Tim and Marissa who were newly engaged, but they wanted to be on their own, so we offered to take two other people, but only Rich decided to join us. Everyone will be heading to Downtown Disney tonight so we might meet up with them after dinner. I took the car down and made it to our 6:30 pm ADR. We had a table right next to the small stage in the middle. Rich and Kelli quickly ordered a Guinness and a chocolate martini, but I was looking for something unusual. The waitress suggests a Jaygail Sangria - a blend of Strongbow, Peach Schnapps, Fruit Liqueurs with squeezes of lemon & lime and a splash of orange juice. She said it tastes like sangria with a shot of Guinness. Well, I normally don’t drink sangria, but it sounded so weird I had to try one. And yes – it did taste like sangria with a hint of Guinness. For appetizers: Rich ordered the Heritage Tomato salad - heirloom tomato & rocket salad with shallots, parmesan crisps & balsamic reduction; Kelli had a Tart Art - asparagus and goat cheese tart with garden peas, leeks and lemon oil dressed arugula; and I got the Drunk Chicken -whiskey marinated chicken skewers with a Dalkey honey mustard dressing. Kelli and I shared and we loved both dishes. Why are appetizers always the highlight of a meal? One day we will just do a variety of appetizers and desserts and forget the main meal. The entertainment started and the music, atmosphere and the step dancers were fantastic! We are definitely coming here again – and we haven’t eaten dinner yet. For the main course Rich ordered the special Rib-eye; Keen Eye for the Shepherds Pie for Kelli and I had the Me Crock 'o' Mussels - Fresh Blue Hill Bay mussels served in a saffron, grape tomato and leek broth. The food was very good but I had better mussels at Artist Point. Kelli liked her Shepherds Pie but couldn’t finish it. For dessert Kelli ordered some ice-cream while I got the Me Ger's Bread & Butter Pudding and Rich got a Bailey's Crème Brulee tart –It looked more like a slice of cake. The bill with drinks and tip came to a hefty $164.15. After dinner we waddled over to the World of Disney. I’ve heard about the vinylmation figures but had no interest in them. They are plastic Mickey Mouse figurines that are painted with different themes or characters. In most sets - it’s like baseball cards- you don’t know what figurine you are buying. I knew I wouldn’t fall for this old ploy. Kelli did like the “owl” figure in the Cutesters series, so I brought two boxes for her. Maybe she’ll get lucky. I saw that they had a Muppet series. 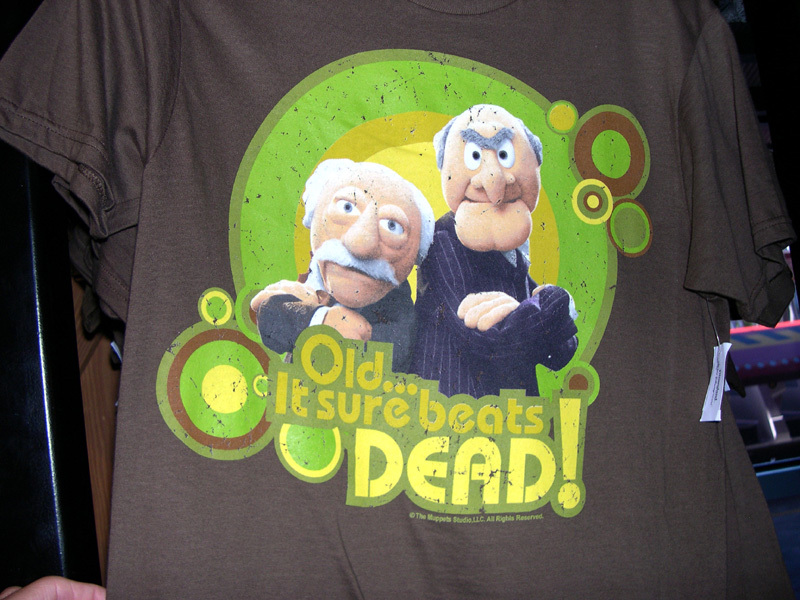 I’m a big Muppet fan so I broke down and bought two boxes for me – so much for no interest in them. 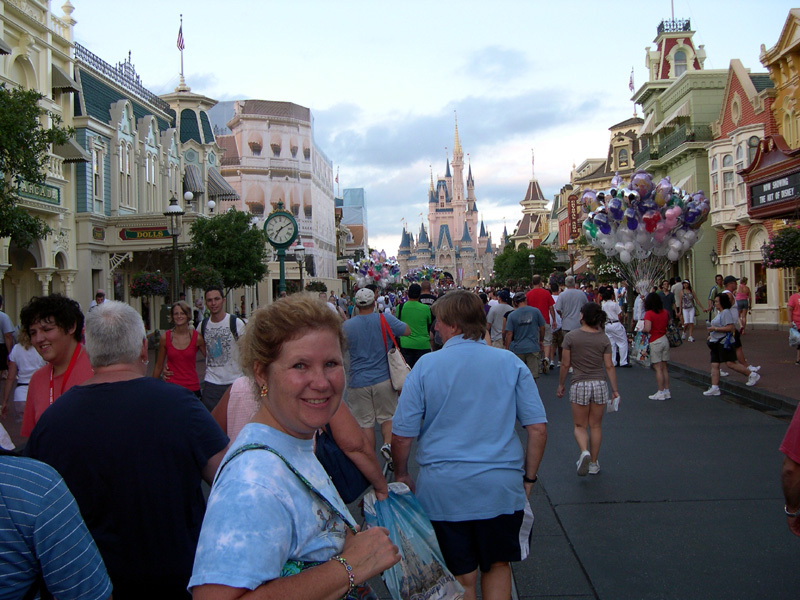 Kelli was tired - so was I - but the car was far away and I wanted to visit the Magic Masters store. So I walked Kelli over to the closest bus stop near Disney’s Days of Christmas so she could return to the room. I walked completely across downtown before realizing I could have gotten on the bus with Kelli and gotten off at the next stop, cutting my walk in half! I bought a few new magic tricks and headed home. 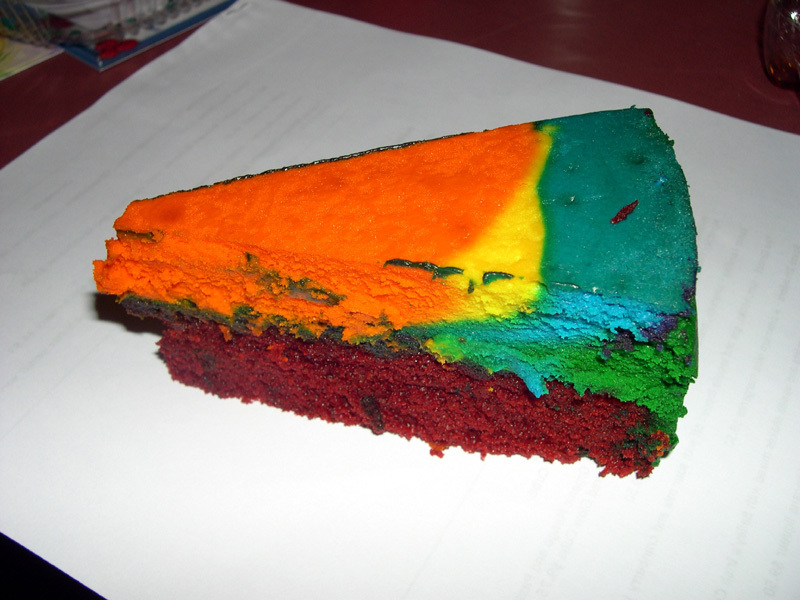 When I got back Kelli bought me a tie-dyed cheesecake from the Pop Century food court –something I’ve always wanted to try. The deep colors didn’t make it look appetizing but it did taste good! Since we were wiped out by yesterdays walking, we decided to sleep in. Bill and I then played the Fantasia Fairways mini golf course (next to Fantasia Gardens). It’s a very tough but fun course. There aren’t any windmills and things on the course, but the undulating fairways were up to 100 feet long! We never made our Sci-Fi diner lunch – maybe next time. We spent midday in the room and pool. Kelli and I decide to exchange the little gifts we brought for each other. She was very happy to try the Cutesters vinylmations. She didn’t get the owl – but was very happy with the ones she got. I couldn’t wait so I opened my Muppet ones. I was hoping for Dr Bunsen Honeydew – it’s impossible to find any merchandise featuring him – and I got him on the first try! Kelli also had discovered the vinylmation pins. Again you don’t know which one you are buying. We ended up with a number of them. After a wonderful relaxing afternoon the whole group headed to the Wilderness Lodge for our group dinner at Whispering Canyons. There are now twenty-five of us. The grandparents of Eric and Kristina had arrived and joined our group for the last few days. We did some shopping in the gift shop and the pin cart. I discovered they have a partial set of vinylmation Muppet pins. It included a Dr Bunsen Honeydew and a mystery pin. So yes- I had to buy it. The mystery pin turned out to be Sweetums. Tom and Theresa approach me for advice since their boy Eric was interested in pin trading. After trying to explain it too him I decide to show him how it’s done. I had just gotten a $1 pin – after spending so much at the gift shop - so I traded that and got a great Jiminy Cricket Pin – my first pin trade! Eric also made a trade, we’ll see if he gets hooked. We all headed into Whispering Canyons and they seated us at three tables. The waitresses threw the napkins and straws at us – I knew at this point with the antics of the wait staff combined with antics of our large group – this was going to be fun. Staying with my trend this trip of trying a variety of liqueurs - I had the Captain's Rum Runner - spiced rum, blackberry brandy, crème de banana and tropical juices topped with dark rum. We had a blast – even some of the adults participated in the pony races. Mike (not me) hid his mother’s plate. I got a great shot of the guilty looking perpetrator. We joined in doing the hokey pokey – with me shooting some great embarrassing video of our group. Patty ordered a root beer and got a huge glass of root beer, she needed two hands to lift it. Later, Joan tried for the “large” root beer – what she got was the tiniest glass. We saw lots of tables calling for ketchup. At one point the waitress had our three tables compete at the same time for ketchup. All twenty-five of us called for ketchup and tried to get the family bringing all the bottles to our particular table. I think we confused them with all of us screaming at them to put the ketchup on one of the three tables. We were celebrating Joan and Rich’s anniversary as well as four birthdays and arranged for a huge sheet cake. There was plenty left so we ran around the restaurant offering pieces of cake to the wait staff and unsuspecting families. One boy got a slice even before his dinner! He must have been happy but I not too sure of the parents. After dinner many of us split up. Kelli and I headed to the Magic Kingdom. I wanted to make an effort for those little added extras one can find if you know where to look. 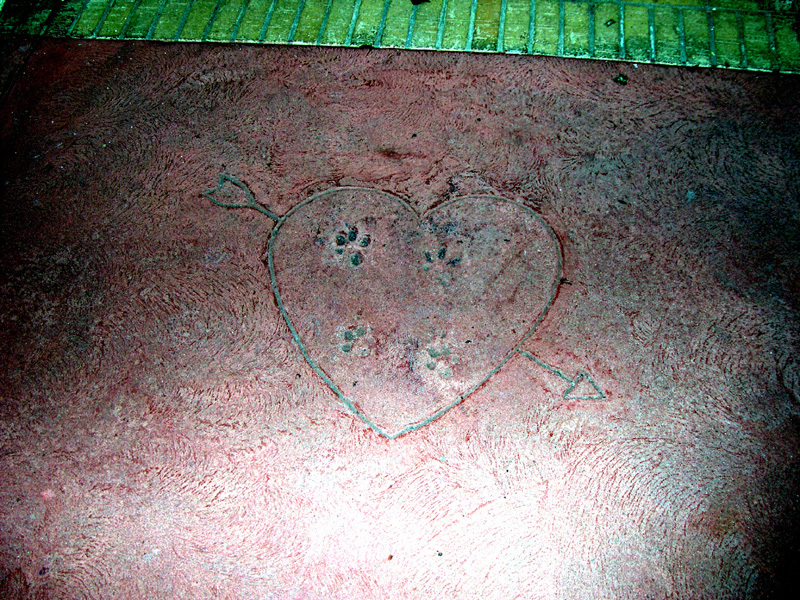 I found the paw prints surrounded by a heart in the cement - of Lady and the Tramp in the town square. I couldn’t find the sitting statue of Goofy, but we did find the old telephone in The Chapeau shop where you can listen in on a party line conversation. Next was listening for the music lessons on the side street off to the right. We then did Buzz Lightyear’s Space Ranger Spin and then looked for the cream cheese filled pretzels we’ve heard about. 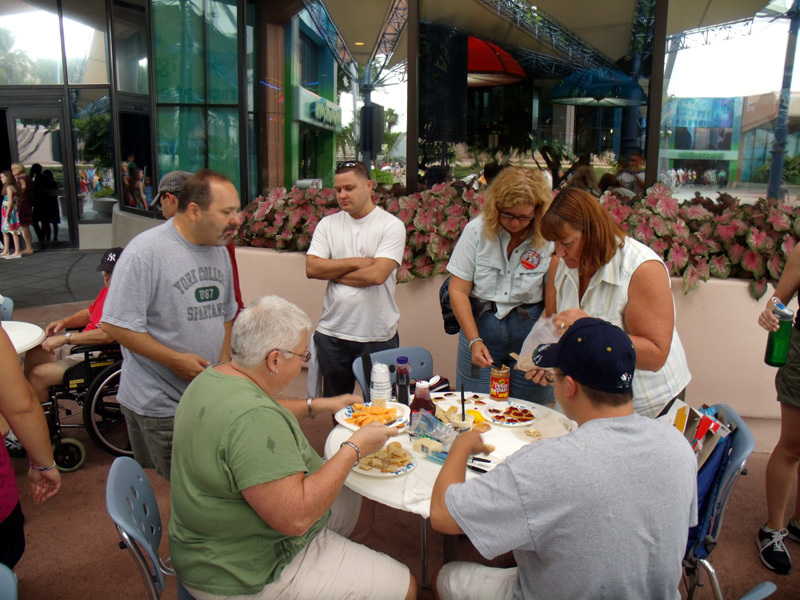 They are at the Lunching Pad under the TTA but they had just closed for the night. 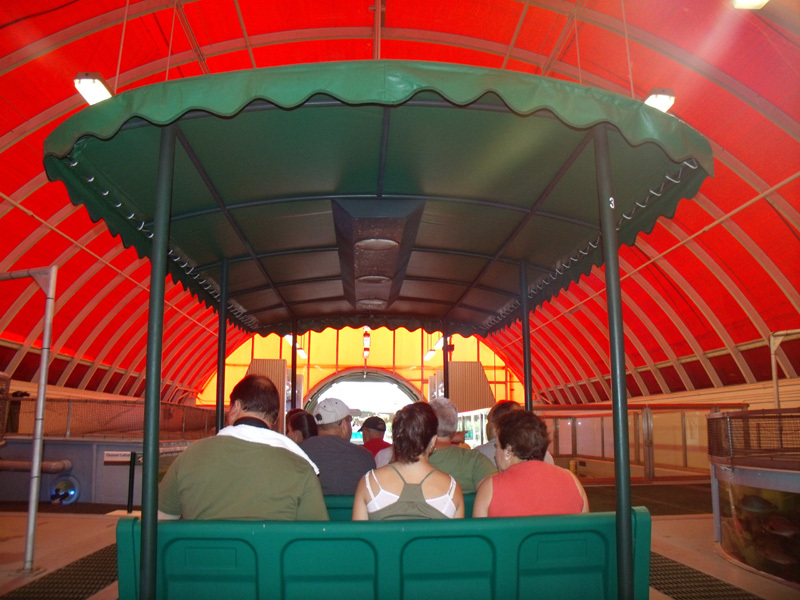 We then did the Tomorrowland Transit Authority PeopleMover (Yes – they added PeopleMover back to the name!) and then joined the Club 626 Dance Party in Tomorrowland at the Rocktower Plaza Stage. It was part of Summer Nightastic! celebration and was loads of fun. The DJ played some great music with Chip and Dale, Goofy, Stitch and Pluto all coming down into the dancing crowd and dancing with the guests. Sadly this was one of the last days it was being done. I hope they bring it back next summer or have it occasionally during the off season as well. We finished the evening with a visit to Monsters, Inc. Laugh Floor. When we came out we saw the last half of the fireworks show, with Tinkerbelle flying over us. It was the same routine, an early 6:30 breakfast and meeting everyone at the bus stop at 7:30. We did the group shot on Main Street (minus Mr F). Then everyone was on their own. Most headed over to EPCOT but Bill, Kelli and I spent the morning here at Magic Kingdom. We quickly headed for the empty fantasyland to do Peter Pan’s Flight, followed by a ride on Dumbo - which gave us a good view of the huge area under construction for Fantasyland expansion. The Many Adventures of Winnie the Pooh was next with the entrance a little hard to find since the facade was cover with construction walls. After a quick rest room break I shot new video of Madam Leota’s moving tombstone at the entrance doors to the Haunted Mansion, followed by the ride. Then we finished up with Snow White's Scary Adventures and Mickey's PhilharMagic. 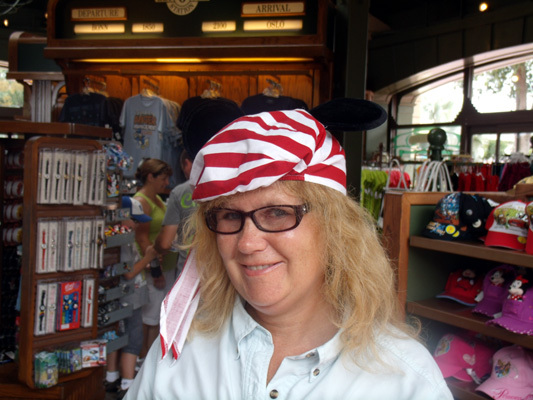 I never remember ever doing the Liberty Square Riverboat so on we went. 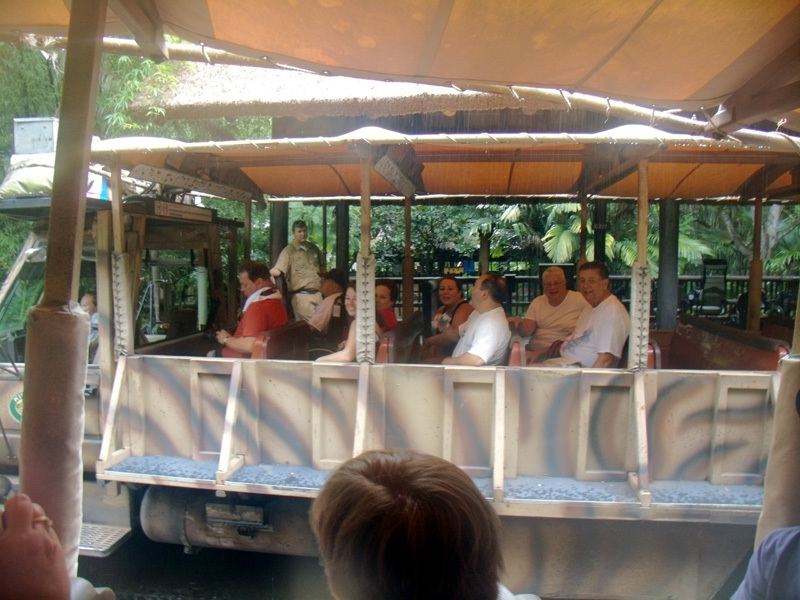 It was a nice relaxing ride, with great views of Big Thunder Mountain Railroad and Tom Sawyer Island, but we had to keep moving to stay in the shade – the sun was already strong. We stopped near the castle to the fountain where if you position yourself just right – the crown is around the princess’s head. We crossed over to Tomorrowland to listen to Sonny Eclipse in Cosmic Ray’s Starlight cafe then finally tried a cream cheese filled pretzels – very good. We made our way to the front of the park where Bill and Kelli went to the restrooms. 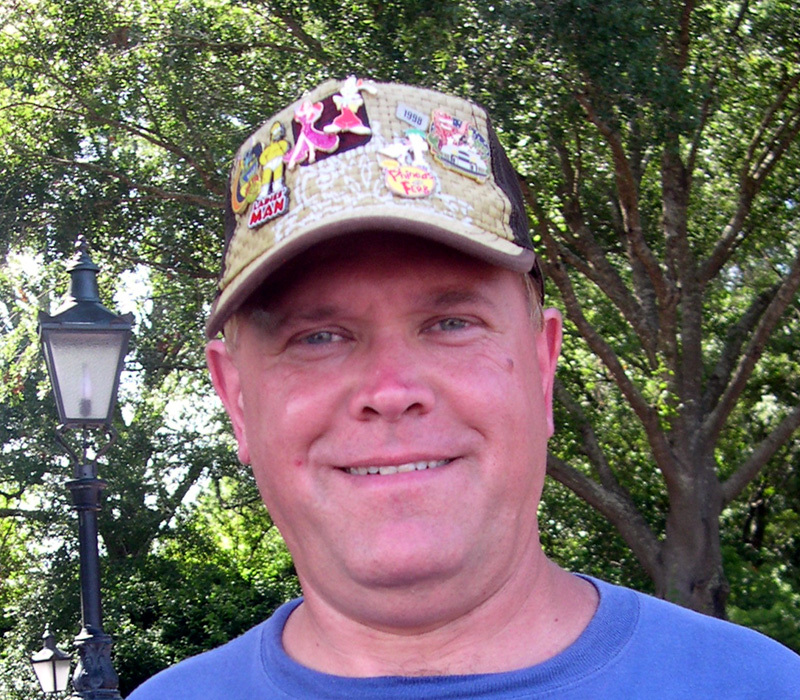 I stayed outside where the Dapper Dans had just finished a set. The quartet overheard that a young couple just got engaged. They went over to the couple and sang a song just to them – it was a nice moment. Bill headed back to his room. Kelli and I headed for EPCOT by monorail. We met up with Joan and Rich for cheese and crackers but I saved my appetite for the empanadas I saw in the world showcase at the Refreshment Port. We picked up our Kim Possible assignment at the kiosk on the middle path from Future World to Showcase plaza. The beef empanada was good. Boy was it hot! I was sweaty. I was worried about how I’d look and smell by the time diner at Kouzzina came around. Not to worry – I had a great idea. In Canada I brought a new shirt and I generously tried on some of the cologne for sale. I’ll switch to my new shirt at the restaurant later. Next stop was in England to look for Kelli’s Cadbury Twist bar and Walker Crisps (chips) but we struck out on both. We watch a bit of The World Showcase Players starting the Arthur's Quest for the Holy Grail skit. One bit of hilarious improvising was when a maintenance worker came by with a huge cart going clunk, clunk, clunk, on the cobblestone sidewalk. The troupe just stopped and silently just stared at her as she slowly made her way past. I guess you had to be there. We headed over the Kim Possible kiosk in Italy for our assignment in Germany. We easily completed our mission here when a light rain started. We ducked into the American Adventure to rest our feet and listened to a great performance by the Voices of Liberty followed by the American Adventure. I incorrectly looked for the plane picture that seems to follow you upstairs and missed it once again. We then did the Kim Possible mission in Japan. This mission had some really cool effects. We shopped in the stores and bought a small bag of shrimp flavored potato chips! I’m glad we bought a small bag – when we tried them when we got home – they tasted exactly like shrimp that was left on a hot dock a little too long – yuck! We stopped into Japan’s Bijutsu-kan gallery. The display “ Spirited Beasts- from ancient stories to Anime Stars” was interesting. It’s hard to imagine that a “super hero’ based on a rabbit would catch on here. We headed toward the International Gateway to walked over to the Boardwalk. On the way we stopped for a delicious Grand Marnier Orange slush from France. We had a 5:00 PM reservation at Kouzzina – Iron Chef Cat Cora’s new restaurant. For drinks Kelli had the Kouzzina Citronge Cafe -Patron Citronge orange liqueur, cafe liqueur, white cream de cacao, and half-and-half and I had to try the Ozzo-tini. Both were good. For appetizers we shared the Goat Cheese-stuffed Grape Leaf - large grape leaf filled with herbed goat cheese and grilled and the Saganaki - seared haloumi cheese with lemon and oregano. We both loved the Saganaki. For our main course we both had the Kouzzina Trio - tasting size portions of Pastitisio, Char-grilled Lamb Burger, and Cinnamon-stewed Chicken with Orzo. Pastitisio was described as a Greek comfort food or Greek style lasagna – it was good but too heavy for a hot summer day – we would have enjoyed this more in the cooler months. I would love to have this after coming in after a cold winter day in New York. 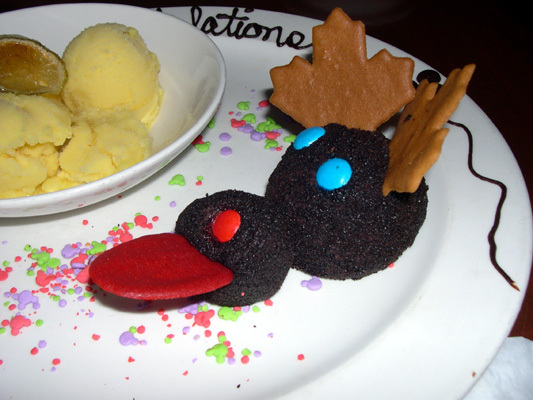 The Cinnamon-stewed Chicken was certainly different for us and one of the great reasons we love dinning at Walt Disney World – to try dishes and tastes we’ve never experience before. The surprise of the night was the lamb burger. It was fantastic. It was the best burger I ever had - and I prefer beef over lamb! I am a big fan of Bobby Flay’s burgers and I was surprised for me to say – it was better than any of his burgers! We were too stuffed to have dessert. Cost :$81.85 plus15.37 tip. During dinner Kelli said how tired she was and was asking if there was anyway back besides walking back to the International Gateway, making your way up and through Future World and the long trek to the bus stops. I thought about it and –yes there is. We can take the nearby boat to Hollywood Studios which would leave us with a short walk over to the buses back to Pop Century! Well – we did save a huge amount of walking – but the boat from the Boardwalk to the Studios was hot and stuffy. There was no air flow through the cabin. It was pretty awful. The ride did feature nice views of both the Swan and Dolphin resorts. I pointed out to Kelli on the big mistake made when they constructed them. The Swan features a huge Swan stature on top along with a huge clam shell. The Dolphin features a Dolphin along with a Lily Pad. 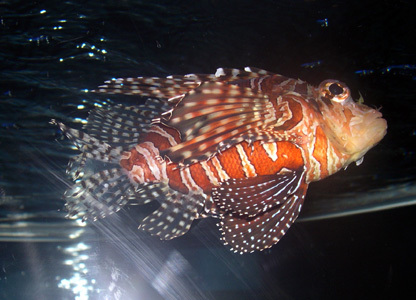 Obviously each was meant for the other – freshwater vs. salt water. We later partied with everyone with all of us sitting on the balcony / walkways in front of our rooms. Next up: “Drinking around the world - but Mainly Germany” and a very long last day. Today we all headed for Typhoon Lagoon for extra morning hours. The group was a little late getting to the bus. This gave Kelli and me a chance to see the Pop Century Food Court “Do the Twist.” The staff stops what they’re doing and dances to the Twist, encouraging guests to join in. We arrived at Typhoon Lagoon only a few minutes before the end of the extra hour. 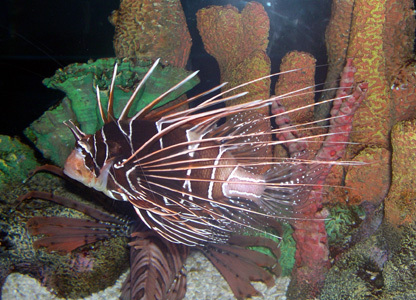 After setting up camp, a few of us headed to the Shark Reef for some snorkeling. I’ve never done this and was looking forward to it. 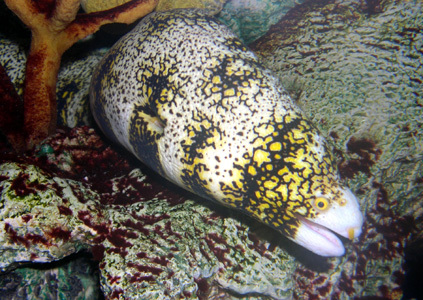 Unfortunately – though I’m a good swimmer, I’m not a good snorkeler. My mind had a hard time getting over trying to breathe with your face down in the water. I wanted to hold my breath. I did see some fish but it will be a while before I try this again. I met up with Kelli on Castaway Creek and we relaxed and floated around twice. I then hit a few slides on my own then found everyone in the tidal wave pool. It was cheese and crackers for lunch again and we left early as we did most of the slides and it was now getting a bit crowded. 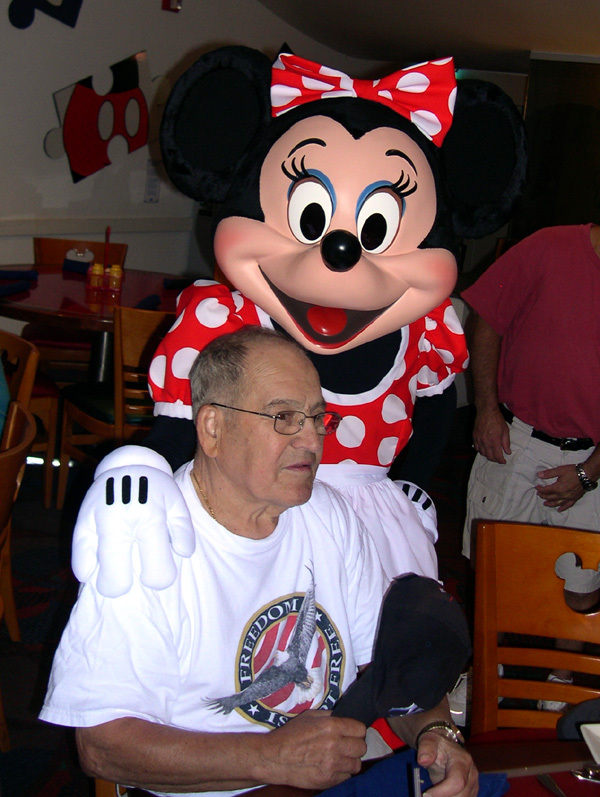 Mr. F will also be getting out of the hospital today and join the gang for our last night group dinner. 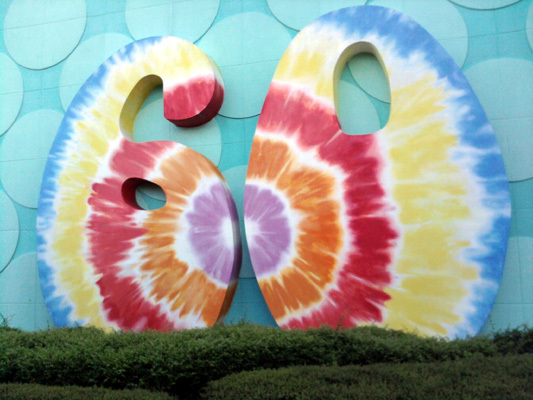 Kelli and I did a relaxing walk around Pop Century. At the bridge we fed the turtles with some leftover bread at the bridge. At one point we had fourteen turtles in site. After freshening up in our room we left early for EPCOT, everyone will be dining at the Biergarten tonight. 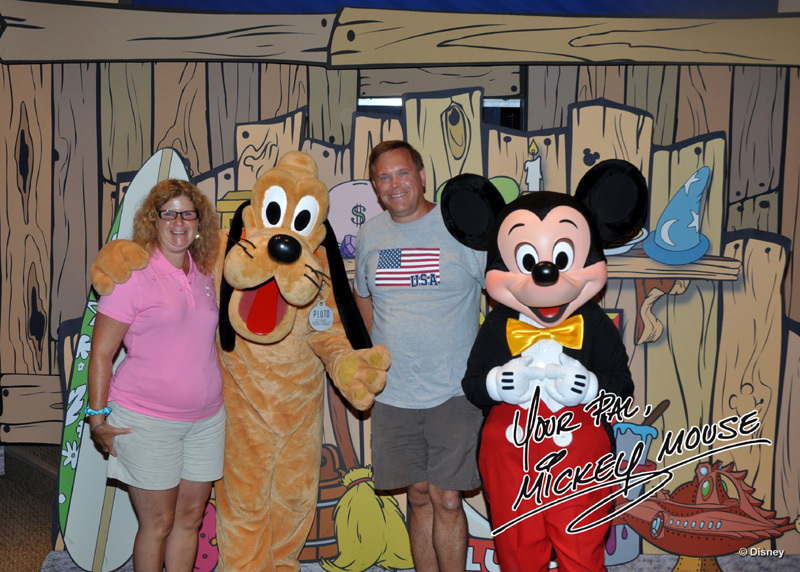 Our first stop was Innovations West for our Disney Visa picture and met Pluto and Mickey. We stopped by England again and this time they had some Cheese and Onion Walker Crisps – score! When we arrived in Germany Kelli and I shared the wine flight for $9. You get to choose 3 wines from about 6 and get about 2 oz pour of each. I chose three of the sweeter wines for Kelli: Gunderloch "Diva" Spatlese Riesling (White); Gunderloch Beerenauslese (Dessert Wine); and Schmitt Sohne Eiswein (Ice Wine). We liked them all but Kelli preferred the Spatlesr Riesling. It turned out they also serve it at the Biergarten. This can be a great opportunity to try the wines and order your favorite in the Biergarten – Note that not all the selections for the wine flight are available in the restaurant. While waiting outside the Biergarten, a cute blond German hostess entertained the kids by showing off her soccer skills – while dress in clothing representative of Germanic cultural heritage. We were seated at three tables on the highest tier, with good views of the stage. I ordered the beer flight, it featured: Becks, Franziskaner Hefe-Weisse, Spaten Oktoberfest, & spaten Optimater. My nephew Mike did likewise. Biergarten is a buffet and the food and the entertainment were good. A number of us got up to dance to a polka and the chicken dance. Cost for two with drinks and tip was $112.03. After dinner, Kelli and I and our nieces and nephews toured the showcase together. We wanted margaritas so we headed for Mexico. We detoured in China to see the acrobats and the movie. There was this one girl juggling a wooden card table with her feet – amazing. I ran into Norway to find the school bread I heard so much about – wow, what a great dessert for such a great price! Kelli and I shared a Fiesta margarita - a triple flavored margarita (lime, strawberry and mango) in Mexico while watching five Green Herons chase each other around the edges of the water. The group headed back to the American Adventure where I finally saw the large painting of the airplane that seems to follow you. To find it make a right turn as soon as you walk through the doors and you find it on the right just before the corner of the room. I was expecting some sort of special effects – but it’s just a regular painting that has this affect on most people – I was amazed on what this artist could do –it is just paint. Kelli couldn’t notice the effect – she was tired and wasn’t to interested – so that may have played a part. After the show we positioned ourselves in Japan to see IllumiNations – the plaza was empty, only one person deep at the railing, so we all had great views. We headed out after that and finish the night outside our hotel room with my last Dogfish 60 minute IPA. At the time I booked the trip we all thought it was great that we had a late flight and could spend nearly a full day in a park. But now we were not looking forward to being out in the heat all day, then getting on a plane. We are all on our own. 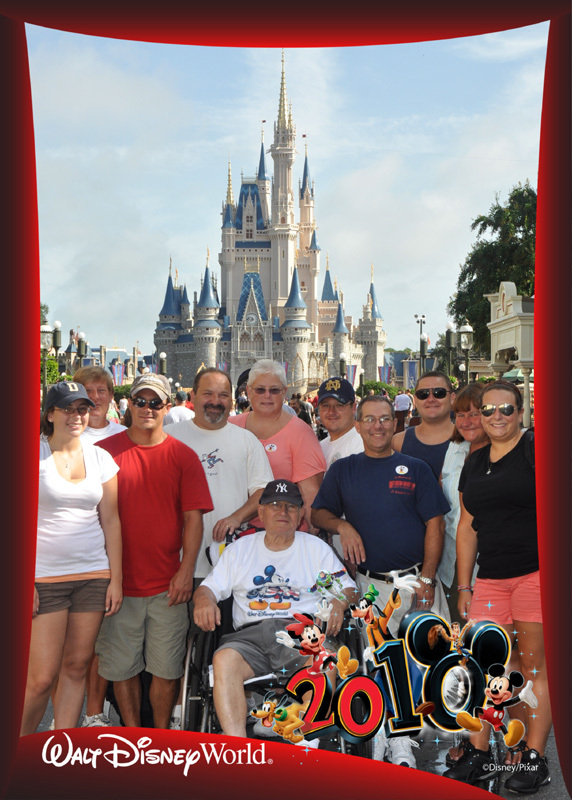 Mr. F's family went to Magic Kingdom for some group pictures which I put on my Photopass account. I got up a little earlier to gas up the rental car and sneak into Disney Hollywood Studios to quickly ride the Tower of Terror and Rock ‘n’ Roller Coaster and fast pass Rock ‘n’ Roller. When I got back Kelli had finished packing. We checked our luggage at Pop Century and Bill, Kelli and I took the bus to Disney Hollywood Studios at 10:40 to catch all the things we missed. We were tired of the heat so I tried to keep us indoors as much as possible and was quite successful. We did Magic of Disney Animation and after the presentation we made sure to look for the classroom where you get to draw a Disney character. I’ve always missed it. We found it and got to draw Pooh. My drawing really looked like Pooh. Kelli thought hers looked like "poo" too. Inside the same building there was a huge display on the upcoming animated movie - “Tangled” base on the Rapunzel story. Near Star Tours we saw the little Jedi's being trained to fight Darth Vader. Next was the Muppet Vision 3D and I looked under the mat of first door on the right (next to the turnstiles) and saw the key for the first time! Next was The American Idol Experience. The set is great – the judges over acted a bit. The middle singer was clearly the best and she won. To keep out of the heat we then did the Great Movie Ride (gangster version) and The Voyage of The Little Mermaid. Walt Disney: One Man’s Dream was scheduled to close soon for refurbishment and I hadn’t seen the movie in a while so we did that. The movie is well worth seeing. We headed over and down Sunset Boulevard. Bill posed for a picture as if he was hitching his way across the USA on Route 66. We finished on a high note for me with one last exhilarating ride on Rock and Roll and headed out. 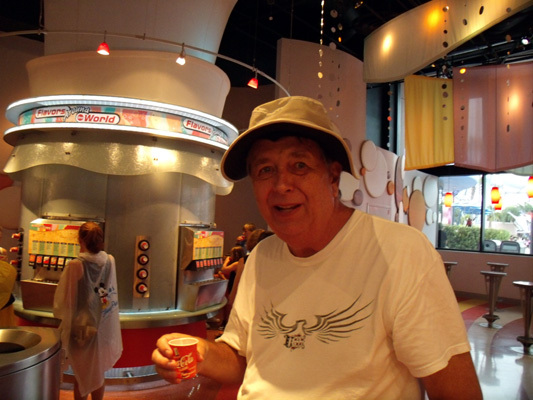 Back at the Pop Century food court, a great Ice Cream Sundae cooled us down. Most of our group is leaving today but four are staying for one more night with an early morning flight. 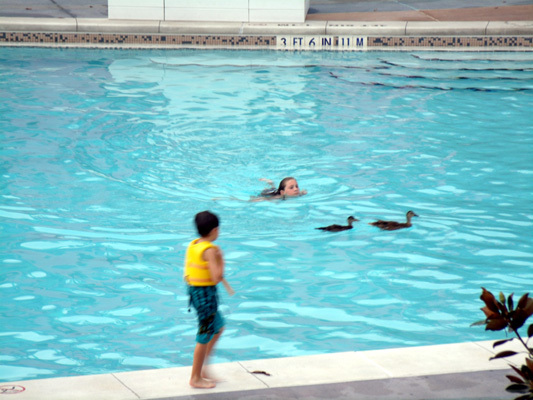 So everyone was either in the pool or using their one room to rest and cool off. We walked over and said our temporary good byes. We picked up our luggage, and headed to the airport. We had dinner there and I tried the sushi (pre-made) and surprisingly was quite good. Our 8:20 PM JetBlue flight left on time and we were back in New York before 11 PM. I always list the new things tried, experienced or saw. Being here seven times in seven years you would expect a short list – but this was one of my longest. It really shows how much more there is in Disney World beside the main attractions and how much can change in just a year. The quiet sit down area behind Tamu Tamu refreshments.